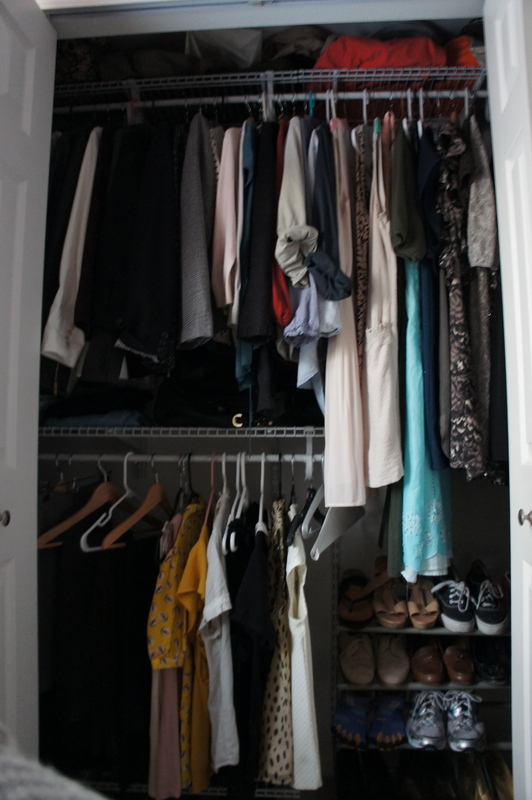 I think every girl dreams of having that perfect closet. A closet where you walk in and your clothes are beautifully organized by color, type, and season. If I had a spare bedroom, I would consider turning it into a closet/gym. That probably sounds weird. For my last day off yesterday, I decided to spend the morning fixing my closet. Yes, I enjoy organization as a hobby. My closet was a disaster. I forgot to take a before picture so please refer to this lifelike artistic recreation. It was a mess. Odds and ends I couldn’t find places for were shoved into wire baskets. The wire baskets of crap eliminated most of the hanging space which in turn wrinkled and sent my clothes into the black hole a.k.a. right side of my closet. Thankfully, Home Depot pulled through with closet kits and storage boxes. 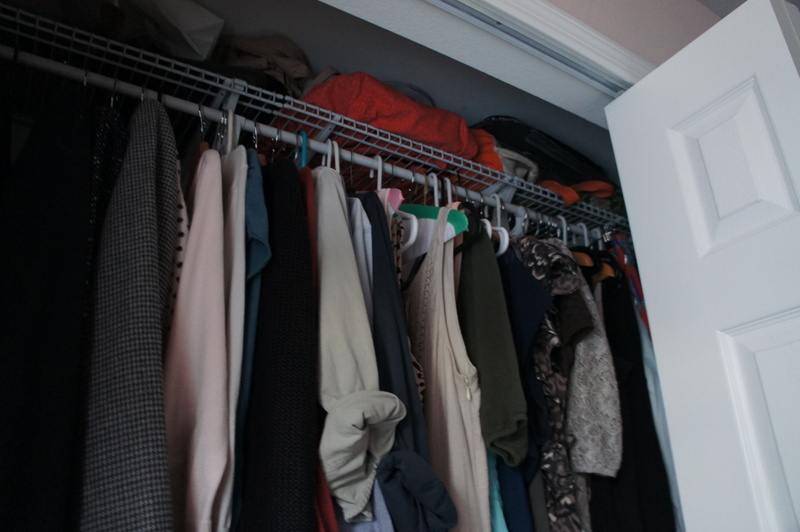 I focused on using my closet for clothes, shoes, and bags only. Art supplies, books, decorations, and DVDs were sorted into boxes and placed either under my bed or up above my closet. Roughly four hours later, I was left with my dream (for the amount of space I have) closet. 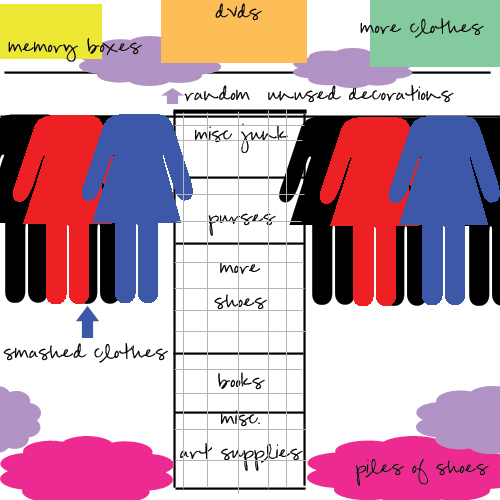 Perfectly sorted by jackets, longer tops, dresses, long dresses, pants, skirts, and shorter tops. Did I mention I installed five shoe racks? I love your artistic recreation!!! Thank you, thank you. I should go into illustration. 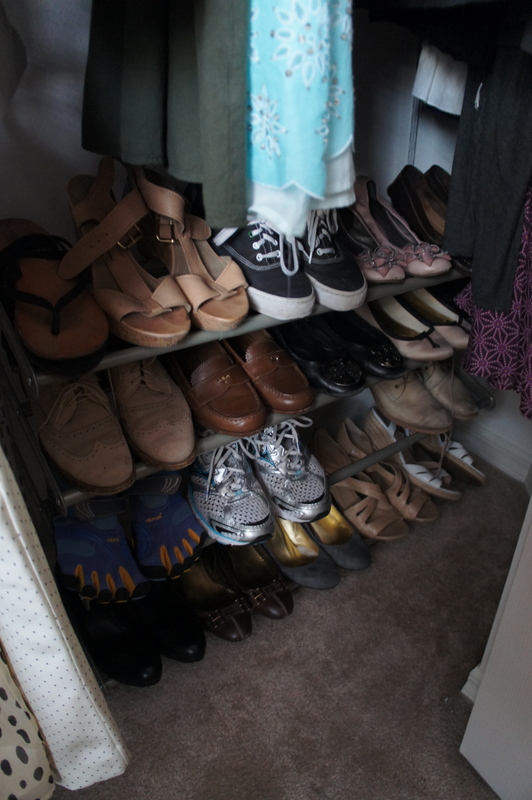 Shoe racks that are made from hardened steel are great and i always use them on my home. They really last longer compared to wooden shoe racks. :,”..